A contract, in its most basic definition, is a written agreement in which two parties are involved that exchange something of value, that in the case of the real estate, that of value turns out to be a house that will be bought or sold. 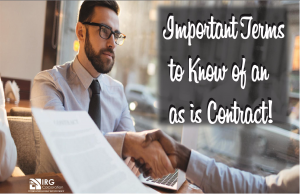 Maybe not all stop to read what a contract says because it can often be tedious or very possibly not too known about what is reflected there, but, despite this you must always have knowledge of the terms that are most used within of the negotiations. Here you must specify all the information regarding the type of payment with which the purchase will be made, either by cash or through the preapproval of a mortgage which you must have at the time of making the offer to streamline the process. Check very well your current financial status and from there you will know better what will be the terms you will use in this section. Although all the parts of a contract are important, this must be carefully and detailed, because here the basic requirements for a contract to follow its course without any problem protecting all parties involved from anything that may harm them. Generally, contingencies are used for buyers, for inspections, disclosures and many others that must be known, and must be established by both the buyer and the seller. Here is placed the estimated time in which the transaction must be completed, which usually hover between 30 and 60 days. This should be studied very well between the buyer and the seller to avoid any problem to meet the established time. Here we usually talk about all the electrical appliances or appliances that may come with the purchase. It is important that you place them in the contract to avoid encountering surprises and, thus, clarify that everything the house has is added to the final price. This part is to verify, in case of a loan, that the money that has been lent will be invested in the best possible way, for that reason, a third party will be in charge of evaluating and estimating the real price of the house thanks to different parameters that they will indicate the value that it has. Here is located the final part of the whole process of purchase or sale, in which, all involved meet to close the transaction. This is when the keys to the new house are obtained and where the payment for the purchase of the house is made. It never hurts to know this type of information that can give you a more objective look at what is happening, whether you are represented by a real estate agent or you are representing someone, it is essential that you handle these terms so that the deal goes the best possible way and the business is beneficial for all. Politician, politician, scientist and American inventor.